When a tribe of primitive cave-dwelling natives abducts two people from a nearby town, a group of locals set off on a rescue mission not fully aware of what is in store for them. "Bone Tomahawk" is a dramatic horror western written and directed by S. Craig Zahler. This is Zahler's directorial debut, though he has another writing on the film "Asylum Blackout." This movie stars Kurt Russell as Sheriff Hunt, Patrick Wilson as Arthur, Matthew Fox as Brooder, and Richard Jenkins as Chicory. When Arthur's wife Samantha, played by Lili Simmons, and Deputy Nick, played by Evan Jonigkeit, are abducted by a primal cannibal cave tribe of Native Americans, the aforementioned four set off on a rescue mission, though they aren't exactly sure how dangerous, large, or savage this tribe may be. 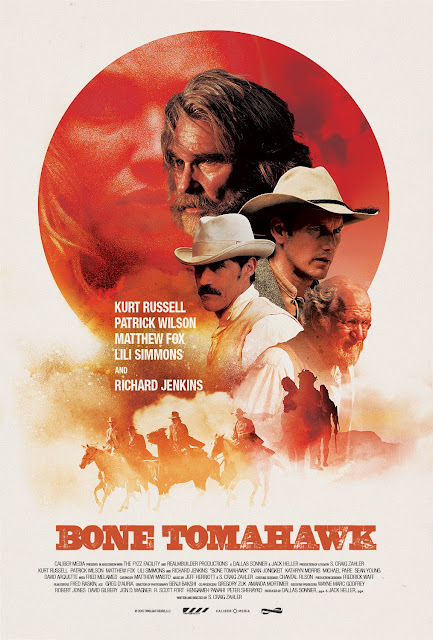 We have heard a lot of positive word-of-mouth about "Bone Tomahawk" for some time. The film opens interestingly enough and has a couple gory moments early on, though the acting isn't anything spectacular and the dialogue is pretty dry. Once Samantha and Deputy Nick are abducted and the posse sets off after their abductors, the film slows to a snail's pace. The entire middle portion of the movie involves the group slowly wandering through the desert dealing with things outside their primary mission. Arthur had a bad leg injury from the start, and that becomes a major plot device as the film trudges onward with little clues foreshadowing what is to come. There are a couple of moments thrown in to make their quest a bit longer and a little more difficult. We are sad to say that this middle portion is mostly boring. From the brief appearances we see of the villains early on, they seem to be supernatural, an angle we wish Zahler would have used but failed to do so (and to his disadvantage). The cave dwellers are very reminiscent of the antagonists from "The 13th Warrior." That film at least played with the idea that the antagonists were supernatural creatures before revealing they were merely a tribe of humans using their scary facade as a battle tactic. It is at the end of "Bone Tomahawk" where the group of heroes finally faces off with this savage foe and this is exactly when the excitement and entertainment factors ramp up. There are a couple of extremely unsettling, uber-violent scenes that are disturbingly gross. It's obvious that every other chance to show blood and carnage was purposefully avoided in order to deliver a wicked ending where all of the waiting pays off to some extent. We would like to say this movie is entirely worth it, but the final showdown isn't quite epic enough to fully justify the meandering pacing problems in the middle section. Those behind the scenes certainly could have edited a good chunk out of the second act, and they could have added some tension by showing the captives once in a while as a looming threat in order to develop the villains a bit more. In the end, "Bone Tomahawk" is a drama horror western mixed bag that never completely find a perfect balance.